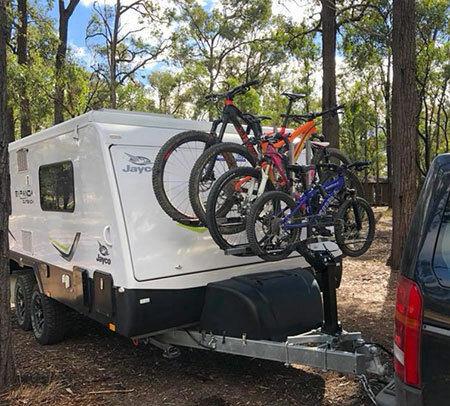 At last a thoroughly engineered and highly effective bolt-on solution for adventure travellers who demand maximum convenience when travelling with bicycles on their Jayco Expanda caravans and pop tops. 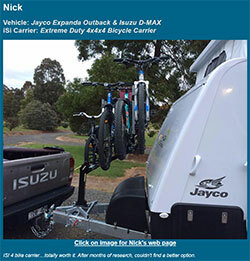 Traditionally the iSi Extreme Duty bicycle carrier is specified by the big hitters in the off-road trailer market and now this bicycle carrier is available to all Jayco Expanda owners - with the added bonus to swap the bicycle carrier between the front of the caravan and the back of the car and 4WD. Rigorously tested over many thousands of kilometers over the roughest and toughest tracks and terrain, iSi bicycle carriers are precision manufactured to traverse the most severe track surface conditions on the planet. 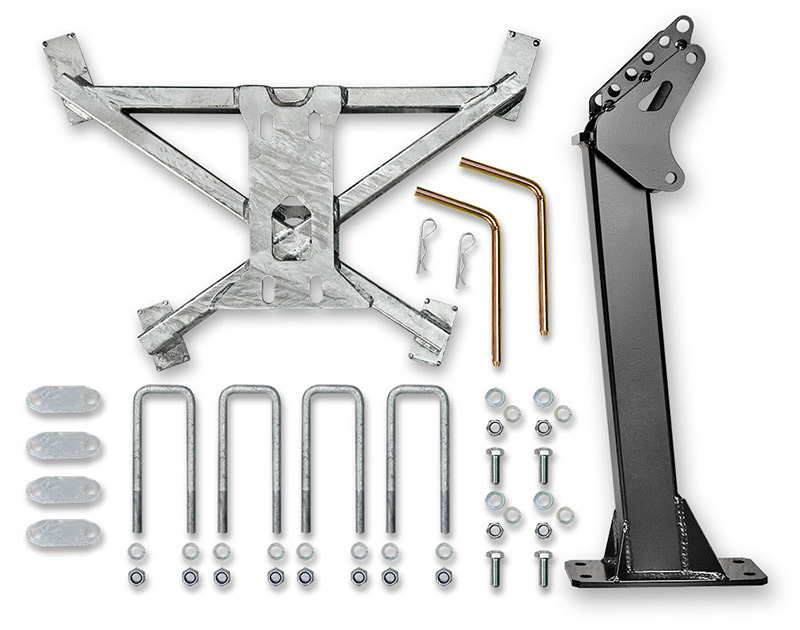 This iSi Cross-Mount delivers a very wide and very long footprint in order to spread the load and eliminate pressure hot spots on the drawbar chassis rails as well as to pick up the strongest point near the nose of the drawbar. This totally eliminates the high point loads that result from narrow welded mounts. 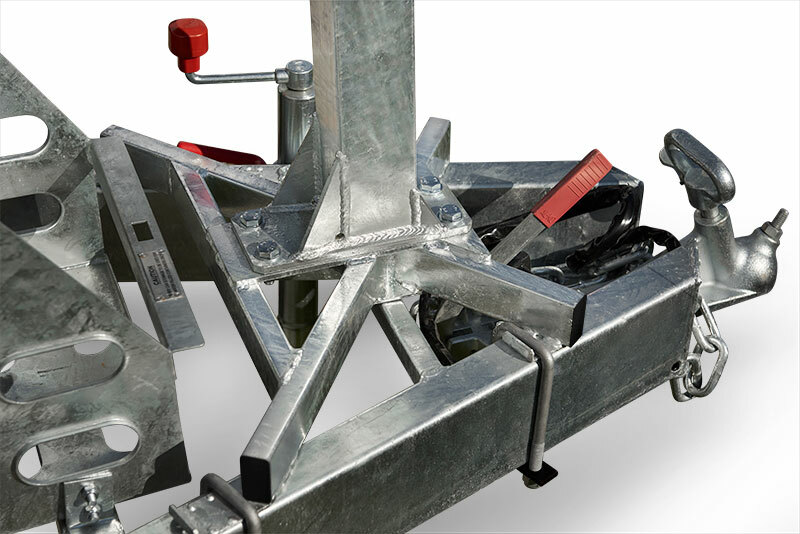 Moreover, the iSi cross-mount clears the hand brake, jockley wheel and is compatible with most weight distribution systems and stone guards. On Expanda models, pivot all the way over to flat in order to deploy the front bed. 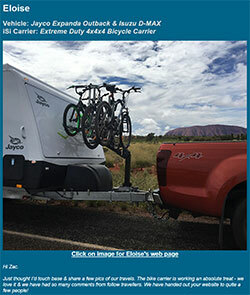 The maximum convenience for zero hassle travel with bicycles all Expanda models. By staggering the bicycles vertically, typical clearance issues such as crank to crank and hub to hub are eliminated so the entire load is made very compact. This results in the greatest clearance possible from the tow point. Moreover, the iSi bicycle carrier is designed to allow the operator to load bicycles exactly side by side and eliminate the need to push bikes left and right in order to have them fit together. 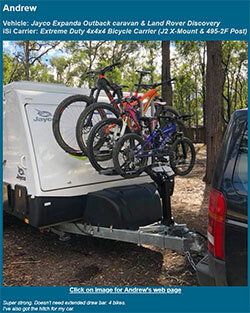 This further enhances trailer articulation by delivering a very narrow load and allows iSi to deliver a drawbar mounted 4-bicycle solution on all Expanda caravans. There is no avoiding the fact that travelling fast over harsh and corrugated terrain can be tough on equipment when it is not designed specifically for the job. 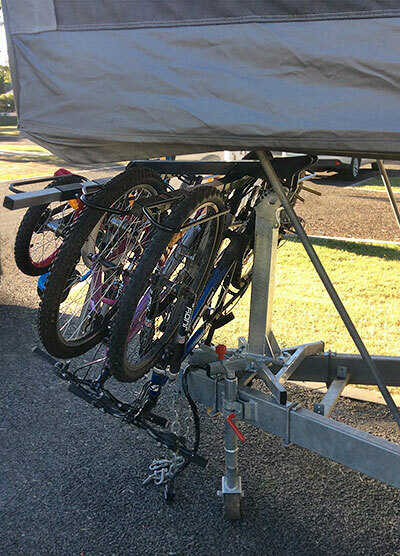 The method which the bicycles are supported is most important - not only where the forces act upon the bicycle, but there the loads go from there to the vehicle or trailer. 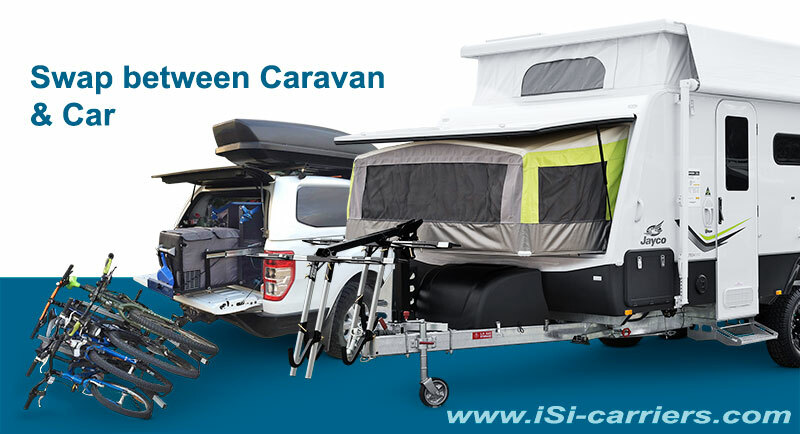 Swap the carrier between the trailer and the car quickly and easily. 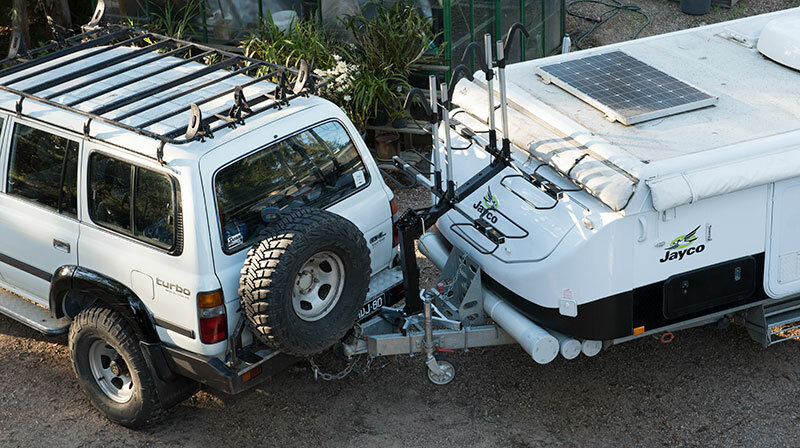 It's great to base camp with the trailer and move the carrier to the car and explore areas that may not be appropriate to drag the Expanda through. When you have the flexibility you use it to make the most of each trip and because we make it easy to swap, you don't go looking for excuses to leave the bikes alone.